Our production facilities include 6,000 sq.ft. of climate controlled greenhouse propagation space and 20,000 sq.ft. of native plant nursery production and overwintering houses. Seed sown in late fall and early winter are stratified in our walk-in cooler and then brought into our propagation facilities beginning the end of February of each season through mid summer. After transplant, the 38 plant trays are grown in heated houses until established enough to proceed to the native plant nursery. Crops are grown to be sold in the current growing season and for overwintering and sale in the following year. During each shipping season we have 2nd year plants and finished one year plants in inventory. 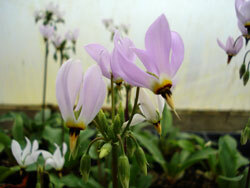 A few native species such as Shooting Star take 2 or 3 years to produce and will be in our native plant nursery until they reach our quality standards for shipping. We also have the capacity to grow specifically for your project. 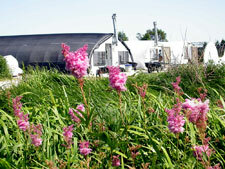 We produce a substantial amount of our plants on contract for designated jobs. You can have faith in our ability to meet your project requirements. We can propagate species not currently on our list when the need arises. Contact us for information on contract growing for your project. Our property also serves as a useful model for rain gardens, vegetated swales, butterfly gardens, and residential landscapes. Our rain garden allows us to harvest and retain water on site to benefit our personal environment and avoid adding to water runoff problems for our downstream neighbors. Our vegetated swale serves as another seed source as well as habitat for numerous birds which use this swale as a nesting site. 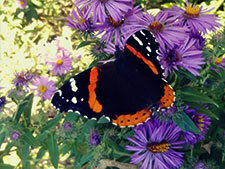 Our prairie landscape serves as seed nursery and educational resource.